9:00 pm 53°F 33°F 48% Clear. Cool. 49°F 9 mi	 12mph /NW 0% 0.00 "
10:00 pm 49°F 34°F 57% Clear. Cool. 44°F 10 mi	 12mph /NW 0% 0.00 "
11:00 pm 49°F 34°F 57% Clear. Cool. 44°F 8 mi	 12mph /NW 0% 0.00 "
12:00 am 47°F 34°F 60% Clear. Cool. 42°F 9 mi	 11mph /NW 0% 0.00 "
1:00 am 43°F 33°F 66% Clear. Chilly. 38°F 7 mi	 10mph /NNW 0% 0.00 "
2:00 am 42°F 32°F 67% Clear. Chilly. 36°F 8 mi	 10mph /NNW 0% 0.00 "
3:00 am 42°F 31°F 67% Clear. Chilly. 36°F 7 mi	 10mph /NNW 0% 0.00 "
4:00 am 41°F 31°F 69% Clear. Chilly. 35°F 8 mi	 9mph /NNW 0% 0.00 "
5:00 am 40°F 31°F 70% Sunny. Chilly. 34°F 8 mi	 9mph /NNW 0% 0.00 "
6:00 am 40°F 31°F 71% Sunny. Chilly. 35°F 5 mi	 8mph /N 0% 0.00 "
7:00 am 42°F 32°F 68% Mostly sunny. Chilly. 37°F 3 mi	 7mph /N 0% 0.00 "
8:00 am 46°F 33°F 61% Mostly sunny. Cool. 42°F 0 mi	 6mph /NNE 0% 0.00 "
9:00 am 51°F 33°F 51% Mostly sunny. Cool. 49°F 3 mi	 6mph /NE 1% 0.00 "
10:00 am 57°F 34°F 42% Partly sunny. Cool. 55°F 6 mi	 7mph /E 1% 0.00 "
11:00 am 60°F 33°F 36% Partly sunny. Cool. 60°F 13 mi	 7mph /ESE 1% 0.00 "
12:00 pm 63°F 33°F 32% Partly sunny. Mild. 63°F 17 mi	 8mph /ESE 2% 0.00 "
1:00 pm 65°F 33°F 30% Partly sunny. Mild. 65°F 21 mi	 8mph /SE 2% 0.00 "
2:00 pm 67°F 33°F 29% Partly sunny. Mild. 67°F 25 mi	 8mph /SSE 2% 0.00 "
3:00 pm 68°F 33°F 27% Partly sunny. Mild. 68°F 26 mi	 8mph /SSE 3% 0.00 "
4:00 pm 68°F 33°F 27% High level clouds. Mild. 68°F 27 mi	 8mph /SSE 3% 0.00 "
5:00 pm 67°F 33°F 28% High level clouds. Mild. 67°F 27 mi	 7mph /SSE 3% 0.00 "
6:00 pm 67°F 33°F 29% High level clouds. Mild. 67°F 23 mi	 7mph /S 2% 0.00 "
7:00 pm 65°F 34°F 32% High level clouds. Mild. 65°F 17 mi	 7mph /SW 2% 0.00 "
8:00 pm 62°F 36°F 38% High level clouds. Cool. 62°F 10 mi	 7mph /W 1% 0.00 "
9:00 pm 58°F 37°F 44% Overcast. Cool. 57°F 10 mi	 9mph /WNW 2% 0.00 "
10:00 pm 55°F 38°F 53% Overcast. Cool. 51°F 9 mi	 10mph /NW 2% 0.00 "
11:00 pm 55°F 38°F 54% Overcast. Cool. 51°F 9 mi	 12mph /NW 2% 0.00 "
12:00 am 54°F 38°F 54% Overcast. Cool. 50°F 10 mi	 14mph /NW 3% 0.00 "
1:00 am 53°F 38°F 57% Overcast. Cool. 48°F 10 mi	 16mph /NW 3% 0.00 "
2:00 am 52°F 37°F 57% Overcast. Cool. 47°F 9 mi	 17mph /NW 4% 0.00 "
3:00 am 51°F 36°F 56% Overcast. Cool. 46°F 10 mi	 18mph /NW 3% 0.00 "
4:00 am 49°F 35°F 58% Mostly cloudy. Cool. 43°F 9 mi	 18mph /WNW 2% 0.00 "
5:00 am 48°F 35°F 60% Partly sunny. Cool. 41°F 9 mi	 18mph /WNW 0% 0.00 "
6:00 am 47°F 35°F 62% Partly sunny. Cool. 40°F 9 mi	 18mph /WNW 0% 0.00 "
7:00 am 48°F 35°F 61% Sunny. Cool. 41°F 9 mi	 18mph /WNW 0% 0.00 "
8:00 am 50°F 35°F 56% Sunny. Cool. 44°F 10 mi	 18mph /WNW 0% 0.00 "
9:00 am 54°F 34°F 47% Sunny. Cool. 48°F 9 mi	 19mph /WNW 0% 0.00 "
10:00 am 57°F 32°F 39% Sunny. Cool. 53°F 12 mi	 21mph /WNW 0% 0.00 "
11:00 am 60°F 30°F 33% Sunny. Refreshingly cool. 56°F 15 mi	 22mph /WNW 0% 0.00 "
12:00 pm 62°F 29°F 29% Sunny. Mild. 62°F 17 mi	 23mph /WNW 0% 0.00 "
1:00 pm 64°F 28°F 26% Mostly sunny. Mild. 64°F 19 mi	 24mph /WNW 0% 0.00 "
2:00 pm 65°F 28°F 25% Mostly sunny. Mild. 65°F 21 mi	 25mph /WNW 0% 0.00 "
3:00 pm 65°F 28°F 24% Mostly sunny. Mild. 65°F 20 mi	 25mph /WNW 1% 0.00 "
4:00 pm 65°F 29°F 26% Partly sunny. Mild. 65°F 18 mi	 25mph /WNW 1% 0.00 "
5:00 pm 63°F 29°F 28% Partly sunny. Mild. 63°F 16 mi	 25mph /WNW 1% 0.00 "
6:00 pm 61°F 30°F 31% Partly sunny. Refreshingly cool. 61°F 14 mi	 23mph /WNW 1% 0.00 "
7:00 pm 58°F 31°F 36% Partly sunny. Cool. 54°F 11 mi	 20mph /WNW 1% 0.00 "
8:00 pm 56°F 33°F 42% Mostly sunny. Cool. 51°F 9 mi	 18mph /WNW 1% 0.00 "
9:00 pm 51°F 34°F 51% Scattered clouds. Cool. 46°F 10 mi	 16mph /WNW 1% 0.00 "
10:00 pm 48°F 34°F 58% Scattered clouds. Cool. 42°F 9 mi	 15mph /WNW 1% 0.00 "
11:00 pm 49°F 35°F 58% Scattered clouds. Cool. 43°F 9 mi	 15mph /WNW 1% 0.00 "
12:00 am 47°F 35°F 61% Scattered clouds. Cool. 41°F 8 mi	 14mph /WNW 1% 0.00 "
1:00 am 45°F 34°F 66% Scattered clouds. Cool. 39°F 9 mi	 13mph /WNW 1% 0.00 "
2:00 am 45°F 34°F 66% Mostly cloudy. Cool. 39°F 8 mi	 13mph /WNW 1% 0.00 "
3:00 am 44°F 34°F 67% Mostly cloudy. Chilly. 38°F 9 mi	 12mph /WNW 2% 0.00 "
4:00 am 43°F 34°F 72% Mostly cloudy. Chilly. 36°F 8 mi	 11mph /WNW 2% 0.00 "
5:00 am 42°F 34°F 73% Partly sunny. Chilly. 36°F 9 mi	 11mph /WNW 3% 0.00 "
6:00 am 42°F 34°F 73% a mixture of sun and clouds. Chilly. 35°F -	 11mph /W 2% 0.00 "
7:00 am 43°F 34°F 70% a mixture of sun and clouds. Chilly. 37°F -	 12mph /W 2% 0.00 "
8:00 am 46°F 34°F 62% a mixture of sun and clouds. Cool. 40°F -	 14mph /W 1% 0.00 "
9:00 am 49°F 33°F 53% a mixture of sun and clouds. Cool. 43°F -	 17mph /WNW 1% 0.00 "
10:00 am 52°F 31°F 44% a mixture of sun and clouds. Cool. 46°F -	 20mph /WNW 1% 0.00 "
11:00 am 54°F 29°F 38% a mixture of sun and clouds. Cool. 49°F -	 24mph /WNW 0% 0.00 "
12:00 pm 56°F 28°F 34% a mixture of sun and clouds. Refreshingly cool. 50°F -	 27mph /WNW 1% 0.00 "
1:00 pm 56°F 27°F 32% a mixture of sun and clouds. Refreshingly cool. 51°F -	 29mph /WNW 2% 0.00 "
2:00 pm 57°F 26°F 31% a mixture of sun and clouds. Refreshingly cool. 51°F -	 31mph /WNW 2% 0.00 "
3:00 pm 56°F 25°F 30% a mixture of sun and clouds. Refreshingly cool. 51°F -	 33mph /WNW 2% 0.00 "
4:00 pm 56°F 25°F 30% a mixture of sun and clouds. Refreshingly cool. 50°F -	 33mph /NW 1% 0.00 "
5:00 pm 54°F 24°F 31% a mixture of sun and clouds. Cool. 48°F -	 32mph /NW 0% 0.00 "
6:00 pm 53°F 24°F 33% a mixture of sun and clouds. Cool. 46°F -	 28mph /NW 0% 0.00 "
7:00 pm 50°F 24°F 36% a mixture of sun and clouds. Cool. 44°F -	 21mph /NW 0% 0.00 "
8:00 pm 47°F 24°F 40% a mixture of sun and clouds. Cool. 41°F -	 17mph /NW 0% 0.00 "
9:00 pm 44°F 25°F 47% Partly cloudy. Chilly. 37°F -	 16mph /NW 1% 0.00 "
10:00 pm 42°F 26°F 54% Partly cloudy. Chilly. 33°F -	 17mph /NW 1% 0.00 "
11:00 pm 42°F 27°F 55% Partly cloudy. Chilly. 34°F -	 17mph /NW 1% 0.00 "
12:00 am 41°F 27°F 58% Partly cloudy. Chilly. 32°F -	 17mph /NW 2% 0.00 "
1:00 am 39°F 27°F 63% Partly cloudy. Chilly. 30°F -	 17mph /NW 3% 0.00 "
2:00 am 39°F 27°F 63% Partly cloudy. Chilly. 30°F -	 16mph /NW 4% 0.00 "
3:00 am 39°F 28°F 64% Partly cloudy. Chilly. 30°F -	 15mph /NW 6% 0.00 "
4:00 am 38°F 28°F 68% Partly cloudy. Chilly. 29°F -	 14mph /NW 7% 0.00 "
5:00 am 38°F 28°F 69% a mixture of sun and clouds. Chilly. 30°F -	 13mph /NW 9% 0.00 "
6:00 am 38°F 28°F 68% a mixture of sun and clouds. Chilly. 30°F -	 12mph /NNW 9% 0.00 "
7:00 am 39°F 28°F 65% a mixture of sun and clouds. Chilly. 32°F -	 11mph /N 9% 0.00 "
8:00 am 42°F 29°F 59% a mixture of sun and clouds. Chilly. 36°F -	 10mph /NNE 9% 0.00 "
9:00 am 47°F 29°F 49% a mixture of sun and clouds. Cool. 42°F -	 11mph /NE 8% 0.00 "
10:00 am 50°F 28°F 43% a mixture of sun and clouds. Cool. 45°F -	 14mph /ENE 7% 0.00 "
11:00 am 53°F 27°F 38% a mixture of sun and clouds. Cool. 48°F -	 16mph /ENE 7% 0.00 "
12:00 pm 55°F 27°F 34% a mixture of sun and clouds. Cool. 50°F -	 15mph /ENE 6% 0.00 "
1:00 pm 56°F 26°F 33% a mixture of sun and clouds. Refreshingly cool. 52°F -	 15mph /ENE 5% 0.00 "
2:00 pm 56°F 26°F 32% a mixture of sun and clouds. Refreshingly cool. 52°F -	 14mph /ENE 4% 0.00 "
3:00 pm 57°F 26°F 30% a mixture of sun and clouds. Refreshingly cool. 54°F -	 14mph /ENE 4% 0.00 "
4:00 pm 58°F 26°F 29% a mixture of sun and clouds. Refreshingly cool. 55°F -	 13mph /ENE 4% 0.00 "
5:00 pm 58°F 26°F 29% a mixture of sun and clouds. Refreshingly cool. 55°F -	 13mph /ENE 3% 0.00 "
6:00 pm 56°F 26°F 31% a mixture of sun and clouds. Refreshingly cool. 54°F -	 11mph /ENE 3% 0.00 "
7:00 pm 54°F 26°F 34% a mixture of sun and clouds. Cool. 51°F -	 9mph /ENE 3% 0.00 "
8:00 pm 51°F 27°F 40% a mixture of sun and clouds. Cool. 47°F -	 8mph /ENE 2% 0.00 "
9:00 pm 47°F 28°F 47% Partly cloudy. Cool. 43°F -	 8mph /NNE 4% 0.00 "
10:00 pm 42°F 28°F 56% Partly cloudy. Chilly. 37°F -	 9mph /N 5% 0.00 "
11:00 pm 42°F 28°F 57% Partly cloudy. Chilly. 36°F -	 9mph /N 7% 0.00 "
12:00 am 41°F 27°F 57% Partly cloudy. Chilly. 35°F -	 10mph /N 5% 0.00 "
1:00 am 39°F 26°F 61% Partly cloudy. Chilly. 32°F -	 10mph /N 4% 0.00 "
2:00 am 38°F 26°F 61% Partly cloudy. Chilly. 31°F -	 10mph /N 2% 0.00 "
3:00 am 38°F 25°F 60% Partly cloudy. Chilly. 31°F -	 10mph /N 2% 0.00 "
4:00 am 36°F 25°F 63% Partly cloudy. Chilly. 29°F -	 10mph /N 3% 0.00 "
5:00 am 35°F 25°F 65% a mixture of sun and clouds. Chilly. 28°F -	 10mph /N 3% 0.00 "
6:00 am 35°F 24°F 65% a mixture of sun and clouds. Chilly. 28°F -	 9mph /N 4% 0.00 "
7:00 am 37°F 24°F 62% a mixture of sun and clouds. Chilly. 30°F -	 9mph /N 4% 0.00 "
8:00 am 40°F 25°F 55% a mixture of sun and clouds. Chilly. 34°F -	 9mph /NNE 5% 0.00 "
9:00 am 45°F 25°F 46% a mixture of sun and clouds. Chilly. 39°F -	 10mph /NE 5% 0.00 "
10:00 am 48°F 25°F 40% a mixture of sun and clouds. Cool. 43°F -	 11mph /NE 5% 0.00 "
11:00 am 51°F 24°F 36% a mixture of sun and clouds. Cool. 46°F -	 13mph /ENE 5% 0.00 "
12:00 pm 53°F 24°F 32% a mixture of sun and clouds. Cool. 49°F -	 14mph /ENE 5% 0.00 "
1:00 pm 56°F 24°F 29% a mixture of sun and clouds. Refreshingly cool. 52°F -	 15mph /ENE 5% 0.00 "
2:00 pm 58°F 25°F 28% a mixture of sun and clouds. Refreshingly cool. 55°F -	 15mph /ENE 5% 0.00 "
3:00 pm 60°F 25°F 27% a mixture of sun and clouds. Refreshingly cool. 57°F -	 14mph /ENE 5% 0.00 "
4:00 pm 61°F 26°F 26% a mixture of sun and clouds. Refreshingly cool. 61°F -	 14mph /ENE 5% 0.00 "
5:00 pm 61°F 26°F 26% a mixture of sun and clouds. Refreshingly cool. 61°F -	 13mph /ENE 6% 0.00 "
6:00 pm 60°F 27°F 28% a mixture of sun and clouds. Refreshingly cool. 58°F -	 12mph /NE 7% 0.00 "
7:00 pm 57°F 28°F 33% a mixture of sun and clouds. Refreshingly cool. 54°F -	 11mph /NNE 8% 0.00 "
8:00 pm 54°F 30°F 40% a mixture of sun and clouds. Cool. 50°F -	 11mph /N 9% 0.00 "
9:00 pm 50°F 30°F 46% Partly cloudy. Cool. 46°F -	 11mph /N 9% 0.00 "
10:00 pm 46°F 31°F 55% Partly cloudy. Cool. 41°F -	 12mph /NNW 9% 0.00 "
11:00 pm 46°F 31°F 57% Partly cloudy. Cool. 40°F -	 13mph /NNW 9% 0.00 "
12:00 am 45°F 31°F 58% Cloudy. Cool. 39°F -	 13mph /NNW 8% 0.00 "
1:00 am 42°F 30°F 64% Cloudy. Chilly. 35°F -	 12mph /N 7% 0.00 "
2:00 am 41°F 30°F 65% Cloudy. Chilly. 34°F -	 12mph /N 6% 0.00 "
3:00 am 41°F 30°F 65% Cloudy. Chilly. 34°F -	 12mph /N 6% 0.00 "
4:00 am 39°F 29°F 68% Cloudy. Chilly. 32°F -	 12mph /NNW 6% 0.00 "
5:00 am 38°F 29°F 70% a mixture of sun and clouds. Chilly. 30°F -	 12mph /NNW 6% 0.00 "
6:00 am 38°F 29°F 71% a mixture of sun and clouds. Chilly. 31°F -	 12mph /N 6% 0.00 "
7:00 am 39°F 29°F 68% a mixture of sun and clouds. Chilly. 33°F -	 11mph /N 5% 0.00 "
8:00 am 43°F 30°F 61% a mixture of sun and clouds. Chilly. 37°F -	 11mph /NNE 5% 0.00 "
9:00 am 48°F 30°F 51% a mixture of sun and clouds. Cool. 43°F -	 11mph /NNE 4% 0.00 "
10:00 am 52°F 30°F 44% a mixture of sun and clouds. Cool. 48°F -	 13mph /NE 4% 0.00 "
11:00 am 55°F 30°F 39% a mixture of sun and clouds. Cool. 51°F -	 14mph /NE 3% 0.00 "
12:00 pm 57°F 29°F 35% a mixture of sun and clouds. Refreshingly cool. 54°F -	 15mph /NE 3% 0.00 "
1:00 pm 60°F 29°F 31% a mixture of sun and clouds. Refreshingly cool. 57°F -	 16mph /NE 3% 0.00 "
2:00 pm 61°F 29°F 29% a mixture of sun and clouds. Refreshingly cool. 61°F -	 17mph /NE 3% 0.00 "
3:00 pm 62°F 28°F 28% a mixture of sun and clouds. Mild. 62°F -	 16mph /NE 3% 0.00 "
4:00 pm 63°F 28°F 27% a mixture of sun and clouds. Mild. 63°F -	 16mph /NE 3% 0.00 "
5:00 pm 62°F 28°F 27% a mixture of sun and clouds. Mild. 62°F -	 15mph /NE 3% 0.00 "
6:00 pm 61°F 28°F 29% a mixture of sun and clouds. Refreshingly cool. 61°F -	 13mph /NE 4% 0.00 "
7:00 pm 58°F 29°F 32% a mixture of sun and clouds. Refreshingly cool. 56°F -	 11mph /NE 4% 0.00 "
8:00 pm 55°F 30°F 39% a mixture of sun and clouds. Cool. 52°F -	 10mph /NNE 5% 0.00 "
9:00 pm 51°F 31°F 46% Partly cloudy. Cool. 47°F -	 10mph /N 5% 0.00 "
10:00 pm 46°F 31°F 56% Partly cloudy. Cool. 41°F -	 11mph /NNW 6% 0.00 "
11:00 pm 47°F 31°F 56% Partly cloudy. Cool. 41°F -	 12mph /NNW 7% 0.00 "
12:00 am 46°F 31°F 57% Partly cloudy. Cool. 40°F -	 11mph /NW 7% 0.00 "
1:00 am 42°F 31°F 65% Partly cloudy. Chilly. 35°F -	 11mph /NNW 7% 0.00 "
2:00 am 41°F 30°F 66% Partly cloudy. Chilly. 34°F -	 11mph /NNW 7% 0.00 "
3:00 am 41°F 30°F 66% Partly cloudy. Chilly. 34°F -	 10mph /NNW 6% 0.00 "
4:00 am 39°F 30°F 71% Partly cloudy. Chilly. 32°F -	 9mph /NNW 6% 0.00 "
5:00 am 38°F 30°F 73% a mixture of sun and clouds. Chilly. 31°F -	 9mph /NNW 6% 0.00 "
6:00 am 38°F 30°F 73% a mixture of sun and clouds. Chilly. 32°F -	 8mph /NNW 6% 0.00 "
7:00 am 39°F 30°F 70% a mixture of sun and clouds. Chilly. 34°F -	 7mph /NNW 7% 0.00 "
8:00 am 43°F 31°F 64% a mixture of sun and clouds. Chilly. 39°F -	 6mph /NNW 7% 0.00 "
9:00 am 48°F 31°F 53% a mixture of sun and clouds. Cool. 45°F -	 7mph /WSW 6% 0.00 "
10:00 am 53°F 31°F 44% a mixture of sun and clouds. Cool. 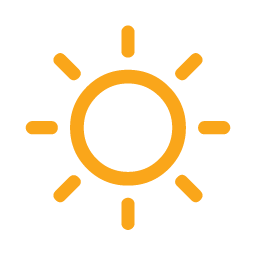 50°F -	 9mph /S 6% 0.00 "
11:00 am 56°F 32°F 40% More sun than clouds. Cool. 53°F -	 10mph /S 5% 0.00 "
12:00 pm 59°F 32°F 36% More sun than clouds. Cool. 57°F -	 10mph /S 5% 0.00 "
1:00 pm 62°F 31°F 32% More sun than clouds. Refreshingly cool. 62°F -	 11mph /S 5% 0.00 "
2:00 pm 63°F 31°F 30% More sun than clouds. Mild. 63°F -	 12mph /SSW 5% 0.00 "
3:00 pm 64°F 32°F 30% More sun than clouds. Mild. 64°F -	 13mph /SSW 6% 0.00 "
4:00 pm 64°F 32°F 30% More sun than clouds. Mild. 64°F -	 13mph /SW 7% 0.00 "